PARTY HOSTEL! If you want to have a peaceful sleep for your entire stay, this is not your place. 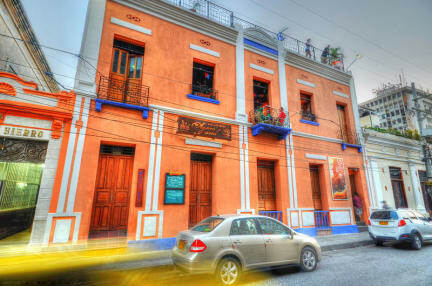 But if you are looking for meeting other travellers and enjoying good parties, stay at la brisa loca. The hostel has a massive rooftop, on which they organize parties from Wednesday to Sunday. Not only travellers, but also locals attend these parties. Food is good at the bar, but the free breakfast is a bit poor. You might need to order extra. Very clean and beautiful hostel! 3 floors, big rooftop and pool. 3 minutes from the beach and directly in the City Centre. Keep in mind that it is a party hostel and it can be hard to get some sleep sometimes especially in the weekends. But if you like raggaeton party's this is the place for you!! A cool place to stay in Santa Marta. Really close to the centre, a lot of bars and restaurants near by. The stuff is really friendly and helpfull. At the weekends a lot of partys going on there, all the locals are coming to the hostel to party. The dorms are clean and you get all you need. You will have a good time there! This hostel offers a nice party atmosphere but that’s pretty much it. The staff is quite unpersonal. Worst of all; there were bugs in our bed (private dorm) and my boyfriend and me were covered in bug bites the next day.